Sammo Hung chalks up another winner for his storied career in this lovable outing. Once again, the movie is filled with energy, humor, and action. This time around, he introduces some romantic comedy elements, so for our money, the previous “Three Brothers” film, Wheels On Meals (1984), is a bit better, but it’s entirely subjective, of course. There’s plenty of expertly done slapstick on show as well, and if Wheels On Meals had our heroes as the Three Musketeers, here they’re reminiscent of the Three Stooges. It’s all very well-shot and well-staged, and the ending certainly doesn’t skimp on the action. Thanks in part to the newly-added presence of co-director/production supervisor Corey Yuen, the Martial Arts have that kinetic, bone-breaking edge that we’ve all become so addicted to. It’s perfectly suited to counterbalance the romantic comedy elements. Benny The Jet also returns from 'Meals, and, as stated earlier, the final fight in the warehouse is awesome, with stellar fight choreography and tons of engaging moments. If you have Netflix Streaming, that’s a good way to view this movie, as it’s nicely letterboxed and subtitled. Hopefully the Three Brothers will reunite, as 1988, the year of this movie, was their last film together to date. It would be amazing to see them all together in a movie that comes to the theater. 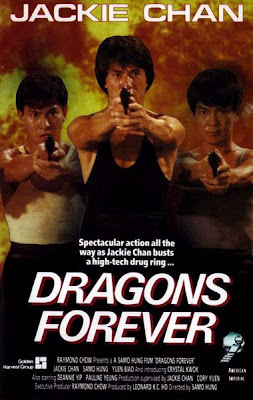 Dragons Forever is a movie that will appeal to die-hard Martial Arts film fans, as well as newbies just getting into the genre. Quality stuff. Great review. Just watched this for the first time a few weeks back. Actually think I prefer it to Meals. Meals just had some long lulls in between the action whereas this feels more non-stop. 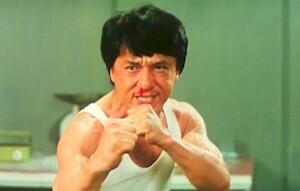 Love the comedy elements like Jackie trying to hide Sammo in his cupboard. This is a Chan classic. The comedy elements really worked. Oh Ty, now you went and done it, lol! This has been one of my favorites and I still contend that you will never see better choreographed fight scenes anywhere, even in Homg Kong films of this vintage. Yes, we definitely agree and more people should watch it.